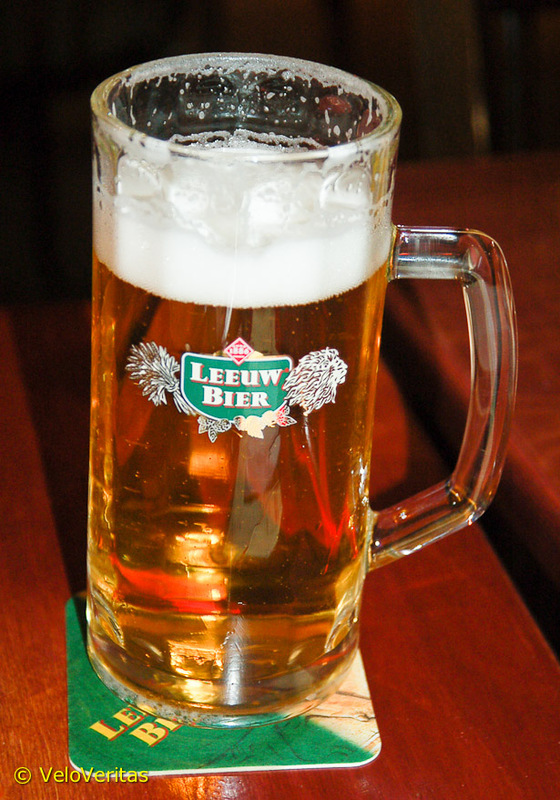 I resisted the bars of Valkenburg and was in bed not long after 10:00 on Saturday night. 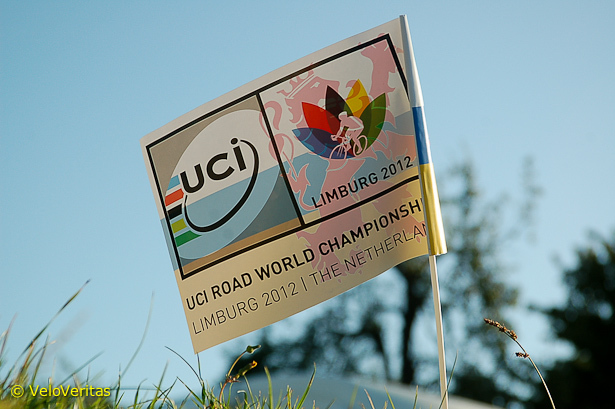 The body clock woke me for 06:15 and I was on the Cauberg before 07:00. 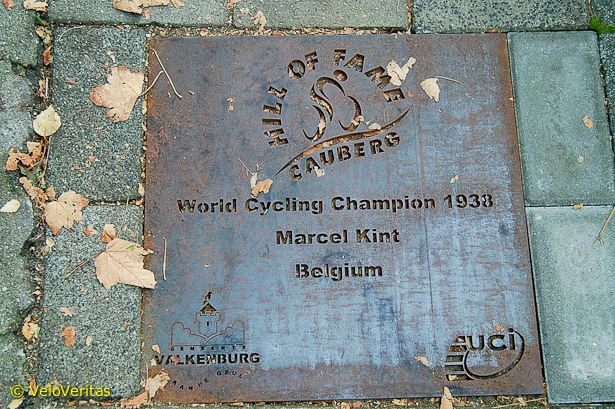 I decided to do my Cauberg piece early on Sunday because the junior time trial starts early on Monday and the police won’t let you walk on the parcours, so best to get a bit of peace and quiet whilst I could. It’s a ‘no messing’ climb, the road lifts just a little past the dozens of bars which line the streets of Valkenburg, then bang! 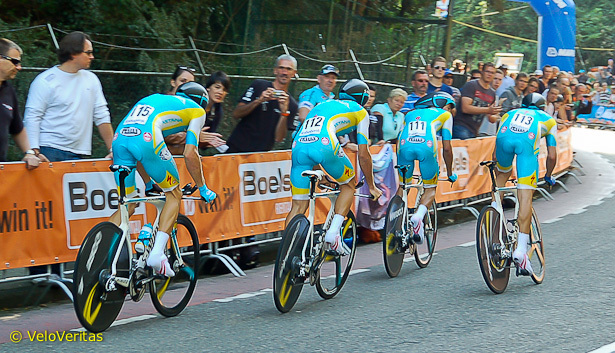 Astana horse up the climb relatively together. By World Tour pro’s standards, it’s not a killer, but it’s steep and unrelenting for around a kilometre with a false flat to follow. With ten ascents, next Sunday ‘keeping your powder dry’ will be of the essence. The winner will have to have kept some watts in his back pocket for the brutal charge which will surely culminate the race. Over what you think is the top – just past the bridge – it drags again before levelling, dipping then running pan flat and arrow straight to the finish line. Boonen wants is badly, so does Gilbert but the Spanish team is very strong with Contador and Valverde well capable of winning here. 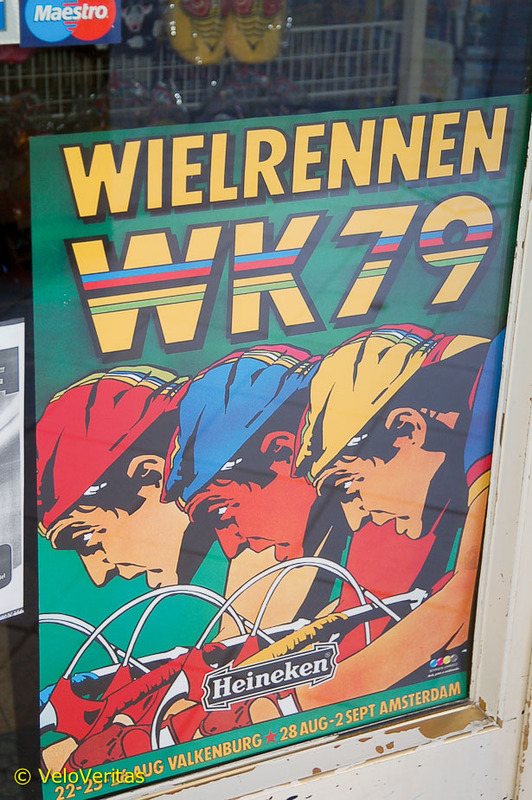 Sagan will be in the mix, maybe Voeckler, Nibali – and just maybe Moser. So that was a six kilometre walk before breakfast – I figured that once I was over the top I’d be as well to keep going to the press room and get my TTT start sheets. 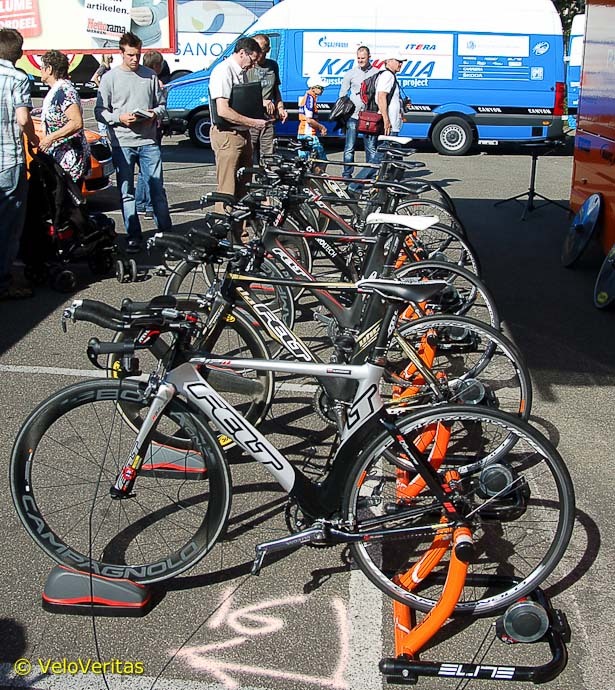 There was the potential for 50 teams to ride, but there were actually 32 on the start sheet. It costs a lot of money for a Continental team to ride a race like this – and then maybe get caught for four minutes by a Pro Tour squad. First off are the South African team with big ambitions, MTN Qhubeka – they’ve just signed Gerald Ciolek as well as Volta stage winner Jay Thomson and former Giro time trial winner, Ignatas Konovalovas. The Qhubeka guys enjoy the fact the race is over. Ciolek is only 25 but has already had an accomplished career, which includes being a former under 23 World Road Champion and a stage winner in the Vuelta a España. 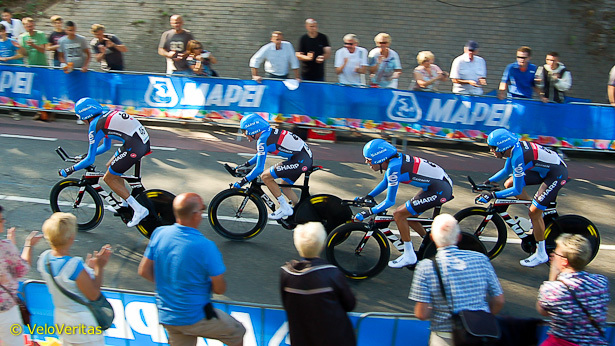 After breakfast I hopped the train up to Sittard where the TTT started. The rail network in Holland is excellent, every train arrives on time to the minute and the longest I’ve waited on a train is around five minutes. The prices are reasonable, too – from Schiphol Airport to Valkenburg, which is a near three hour journey with two train changes was 24 Euros. Edinburgh to Blackpool will cost you £67 and there’s no way you can count on ‘tight’ train changes because so many services run late. Sir Richard, get over to Holland and see how they do it. Sorry, boring – Sittard wasn’t nearly as busy as I thought it might be. I had hoped to ‘blag’ a ride in a team car but the UCI have tightened up and you need specific creds to be aboard a following car, I plan to do a TT bikes piece later in the week so there were lots of bikes snapped. But it was good to get a blether with old friends Dirk Dekeyser – our mechanic at the sixes – and ex-pro Charly Wegelius who’s a DS with Garmin these days. Dirk works ‘day contracts’ with Topsport Vlaanderen – Mercator in the summer; meaning that he’s not employed by the team but is brought in when required on a day by day basis. 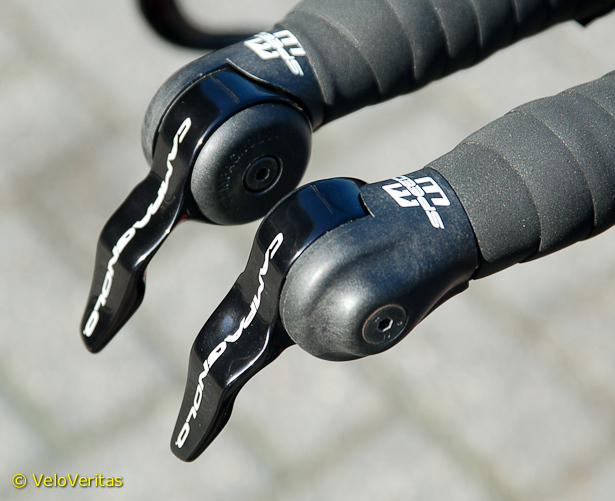 Dirk turns the gear levers upside-down to beat the UCI testers length rules. He was at the recent Giro di Padania, which he says was a very tough race with Nibali an impressive winner. 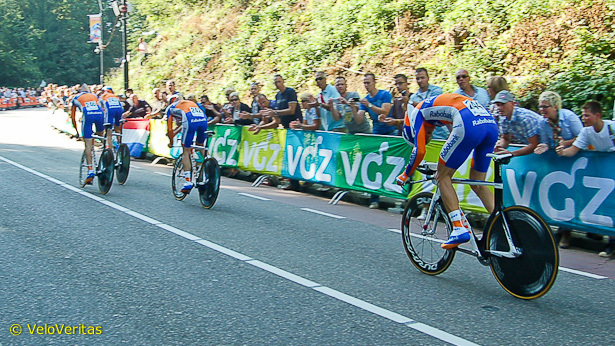 On the Cauberg in the afternoon it was apparent that the Italian was at ease – one of the few riders to look so relaxed. Watch for ‘The Shark’ next Sunday. Dirk was also giving me a few Six Day titbits: Bradley will not be riding the Gent Six Days for one. There were negotiations but Patrick Sercu couldn’t pay what the Tour winner wanted. 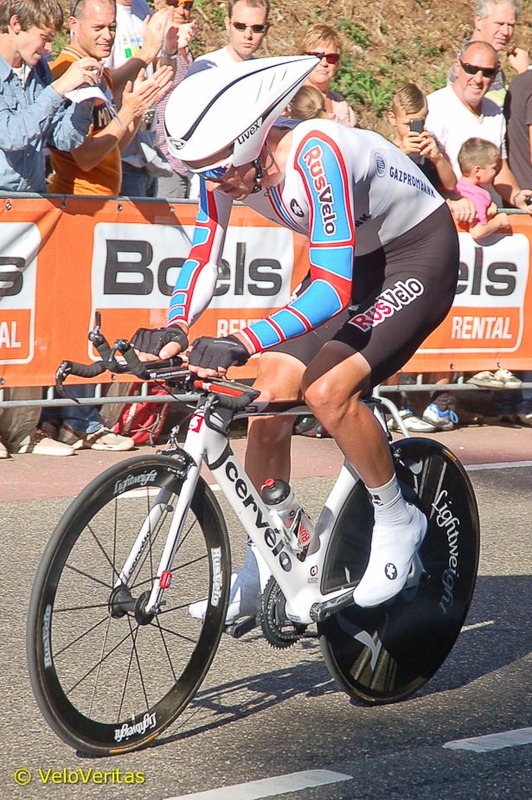 If I tell you he was on €40,000 to ride a derny paced criterium then that may give you an idea. As Dirk says; “40k for an afternoon, so for six days . . . ” Iljo rides with Australian omnium specialist Glenn O’Shea – against fellow Belgians and world madison champions Kenny De Ketele and Gijs Van Hoeck. Get your tickets early for that one. Gossiping and bike snapping duly done, it was back on the train. 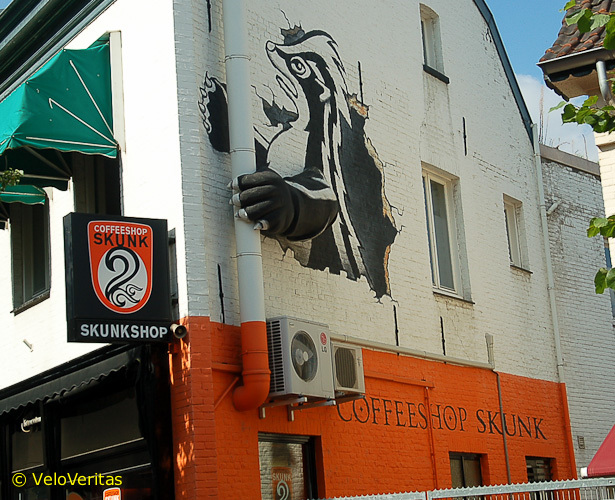 En route the station I passed the ‘Skunk Cafe’ with stressed looking locals slipping in for an afternoon of relaxation. Meanwhile, back in Valkenburg the sun was shining, the crowds were thickening and the bars were in full effect. 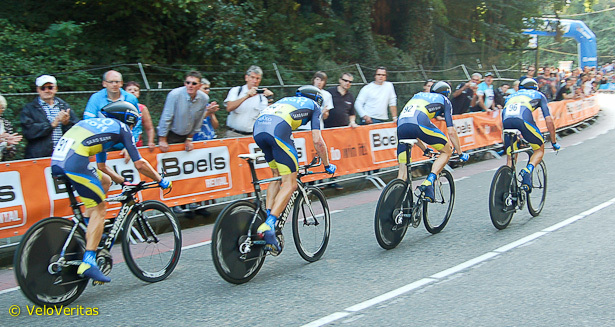 There was a big crowd on the Cauberg but it was really the place to get the best snaps because on the flat they’re going so damn fast. 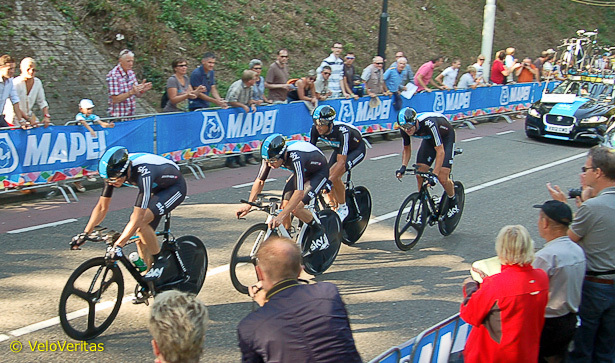 First up were those South African MTN Qhubeka boys – by no mean disgracing themselves in this company. 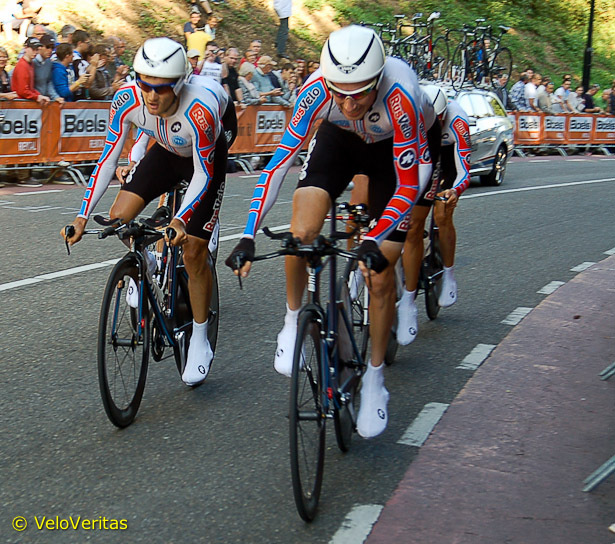 Many teams had lost a rider with the unfortunate casualty having to get over the Cauberg as best they could – some were in a real mess. Liquigas were the first to ‘look the biz’ with Nibali very impressive – but even they had split, with two of their number tying themselves in knots to try to get back. 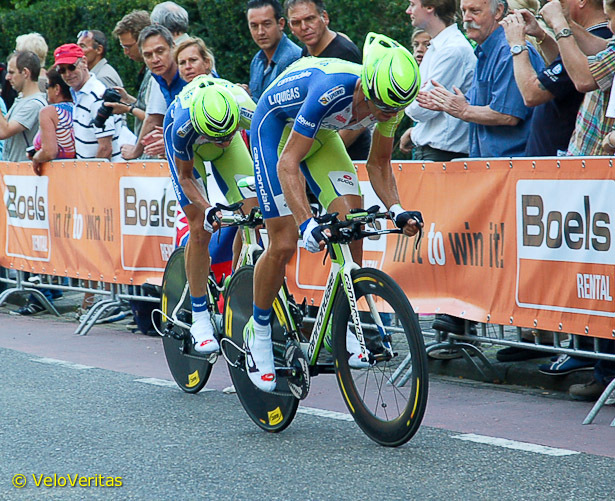 Liquigas break up a little. These two bury themselves to get back on. 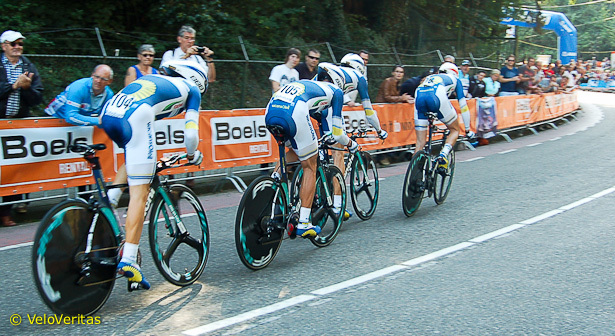 Movistar too looked purposeful but home favourites and flyers at the early check flyers, Rabobank were in a mess – all over the hill. 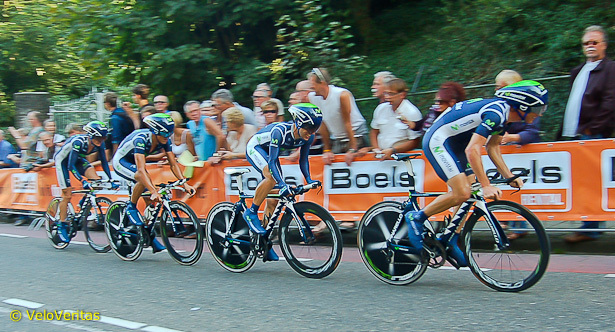 Movistar were one of our favourites before the start. Rabo are blown apart on the climb. 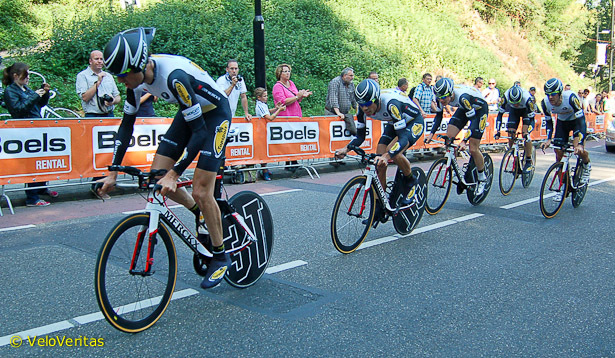 The Rabo Conti team had been in much the same state and I would read later that as the Pro Tour team came into the Cauberg, chrono specialist Stef Clement put in a big turn which blew the team apart. It didn’t cost them a medal, they were too far back, but it certainly cost them fourth place. Jack Bauer was impressive at the front of the Garmin squad but it wasn’t their day and it seemed as if I’d just finished my notes on Garmin when the QuickStep machine glided smoothly into view. They were one of the few teams to have six men left and looked like winners. Jack was one of the Garmin engines today. 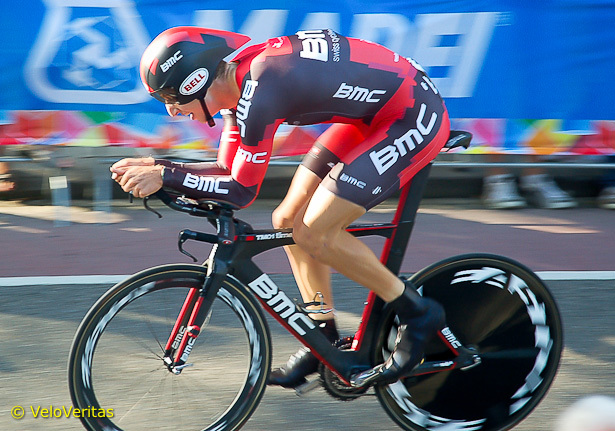 BMC had been my favourites, with riders like Gilbert, Pinotti and Phinney, but the Cauberg did for them – the team had split and Phinney in particular was really hurting. 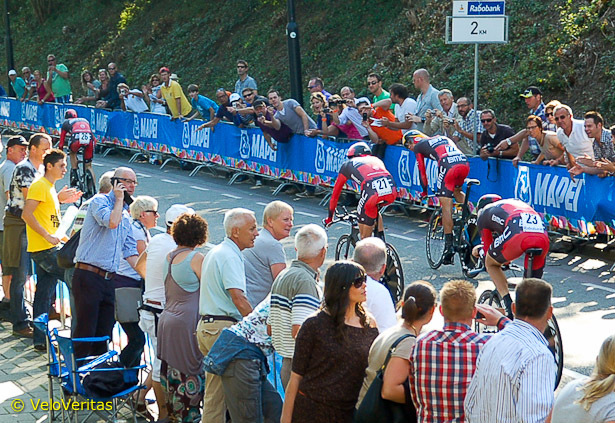 Marco Pinotti drills up the climb. Taylor Phinney is off the back, but staying calm and driving back on. 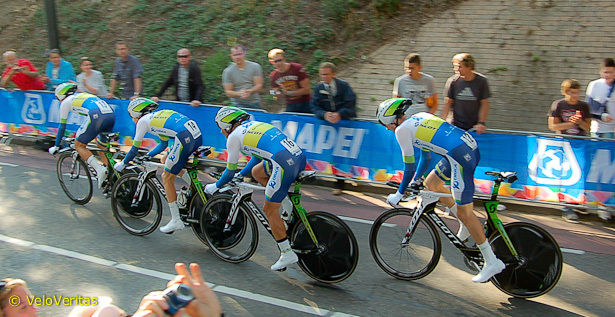 GreenEDGE were down to four but tight and organised – albeit you could see that they weren’t going like QuickStep or BMC. 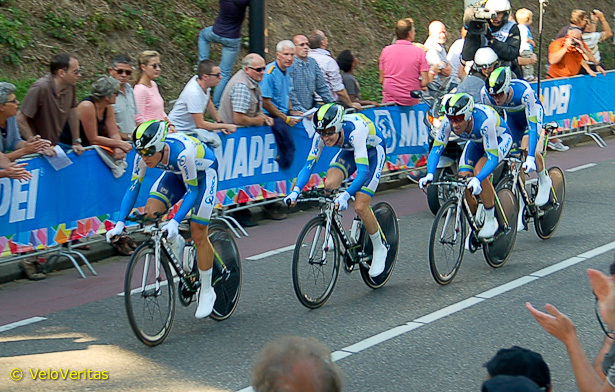 Orica GreenEDGE head for the podium. All that remained was for a weary Sky quartet to get over the hill as best they could. Sky looked somewhat jaded and lacklustre today. A great start to the Worlds – the first of three championships for QuickStep? It’s possible. It was close, but QuickStep took World Championship No.1. 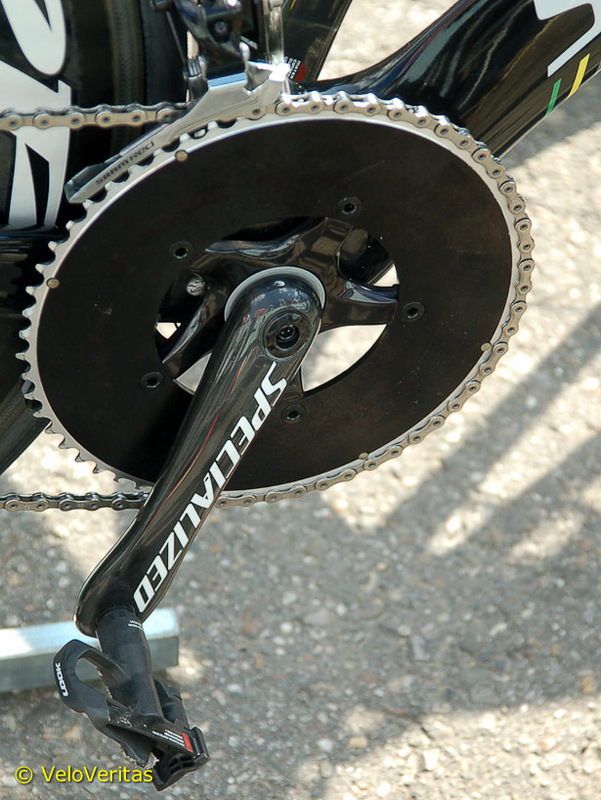 Tony Martin uses a 58T chainring – ye gods. 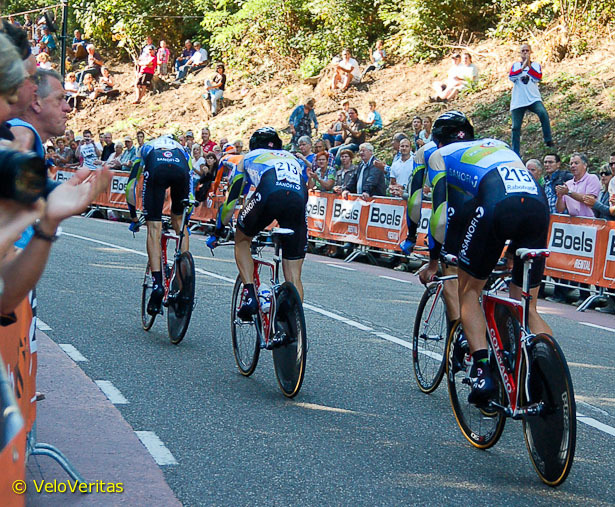 Movistar were one of our favourites. 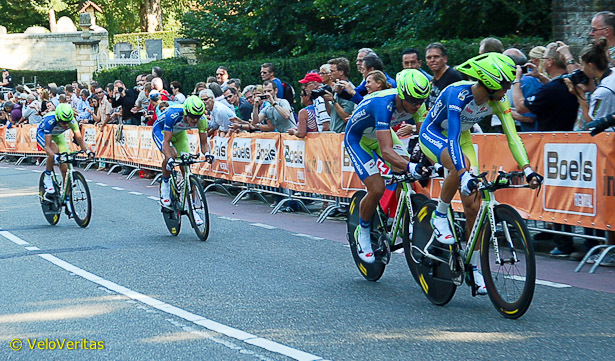 Orica GreenEDGE rode well for third. 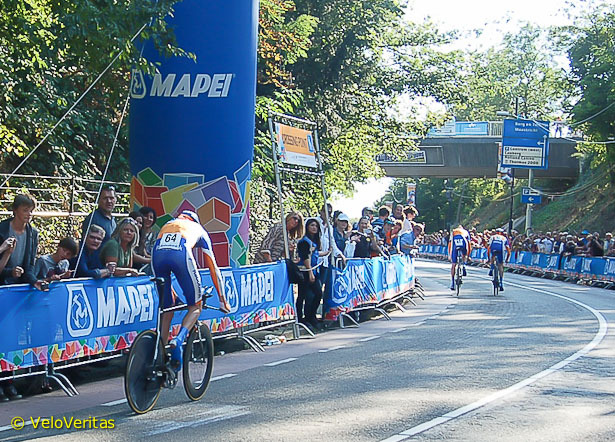 Sky looked somewhat jaded and lacklustre at the Worlds TTT. 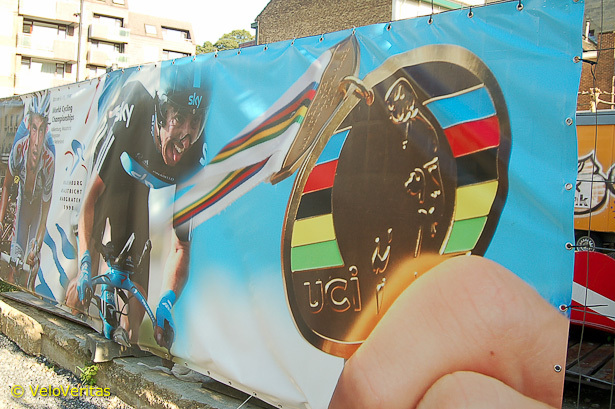 The UCI have marketed the Worlds hard, with merchandise available all over the place. More advertising for the racing. Argos keep it in line. BMC scramble up the climb. 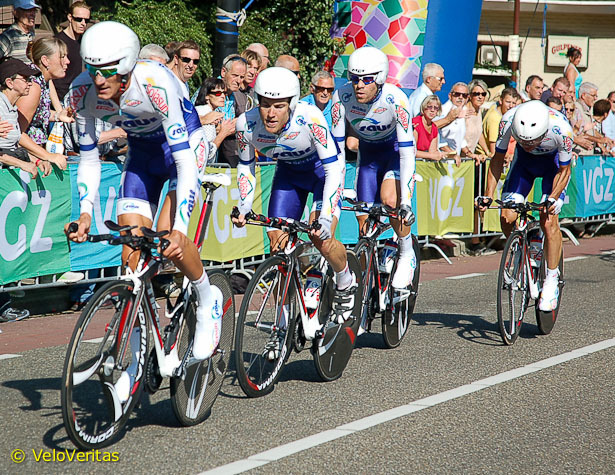 Lampre are under fire for not winning much this season. 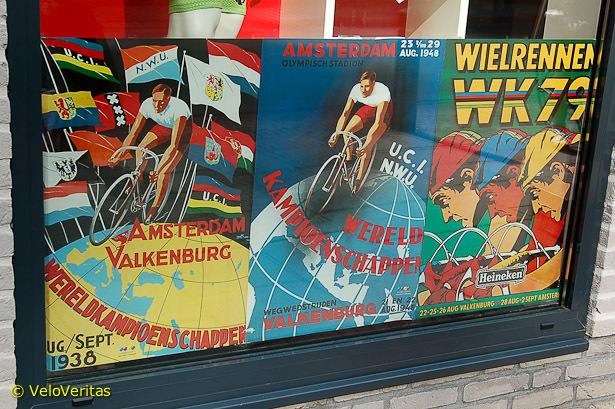 Flecha’s image on the posters. There’s always an oompah band. 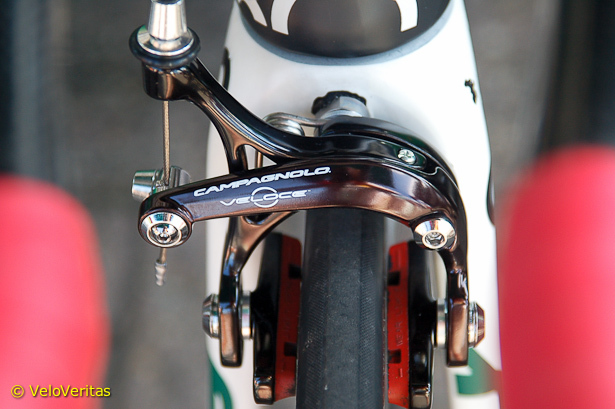 Veloce brakes on the second string team bikes. 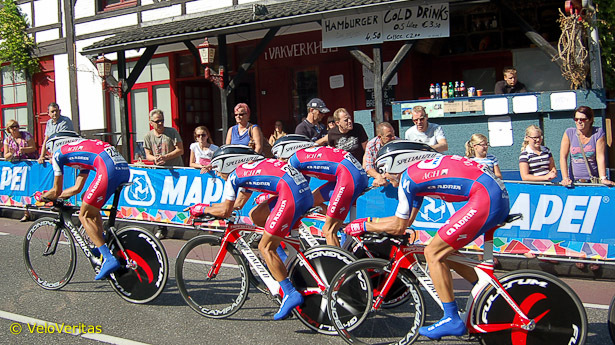 The Itera Katusha U23 squad. Saur Sojason were stone last. 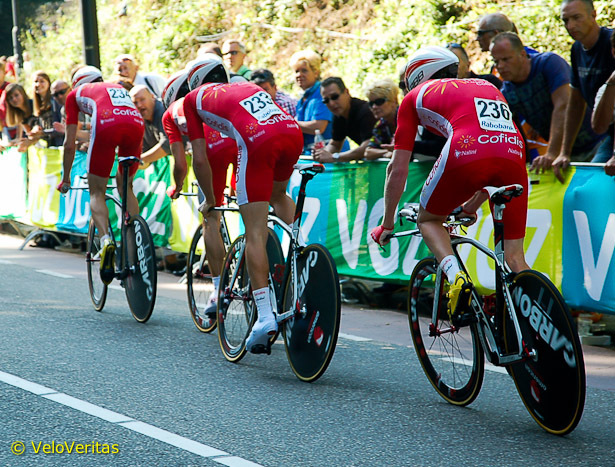 It’s fair to say Cofidis didn’t do well today. 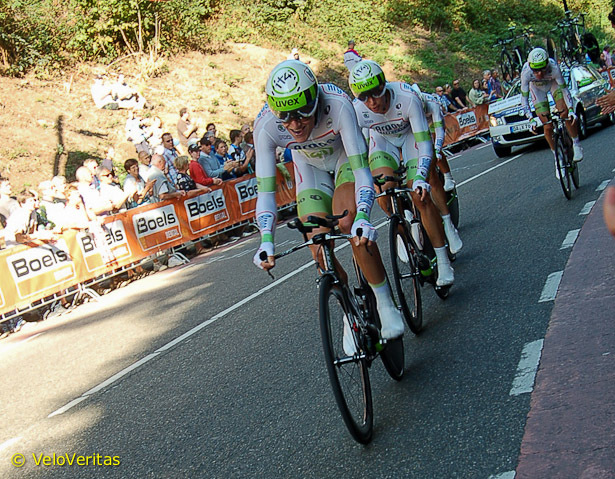 Dirk’s Topsport Vlaanderen – Mercator team ride well up the climb. 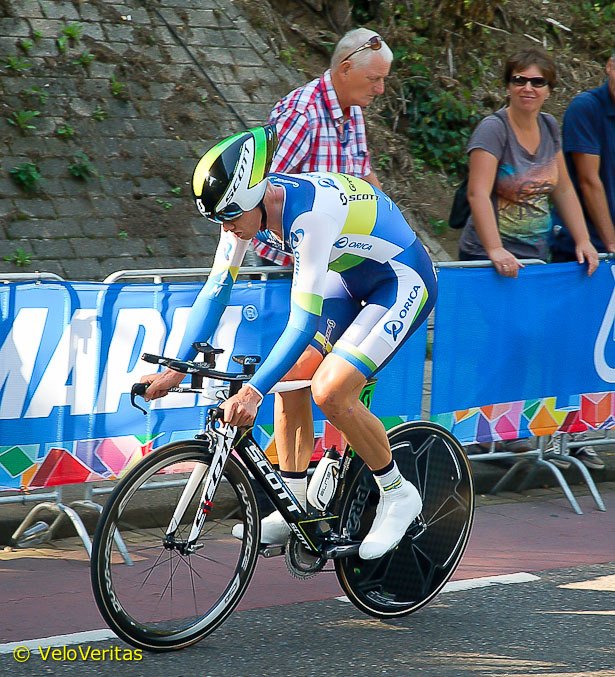 Lightweight wheels and Assos skinsuits don’t make the TTT any easier. 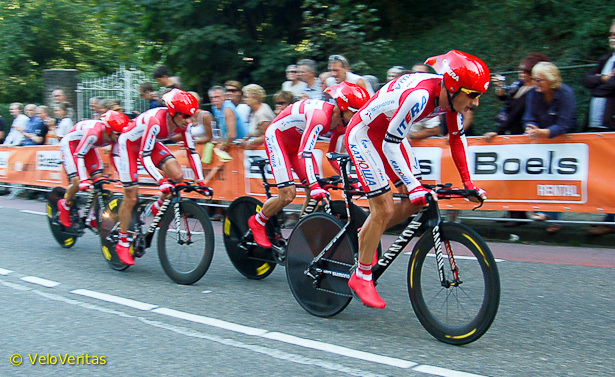 Katusha didn’t expect to get much from the TTT. 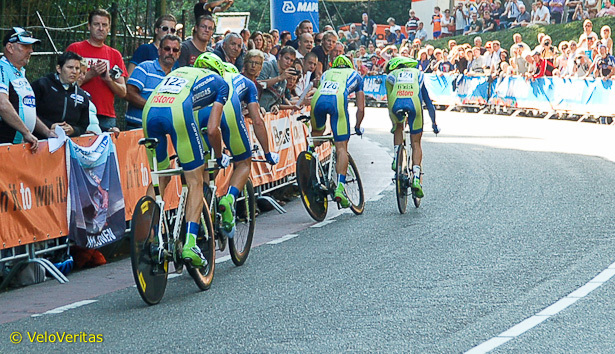 The Orica guys are down to four. Two stragglers keep each other company. Wick's Evan Oliphant carried on for his Plowman Craven team where Tony Gibb left off at last week's Eddie Soens' Memorial Race, by winning the second stage of the Bikeline two day in North Wales yesterday, and finishing up the two-day race in second overall today. The man in pink and blue won the stage yesterday despite the presence of three of the Rapha team in the finale. 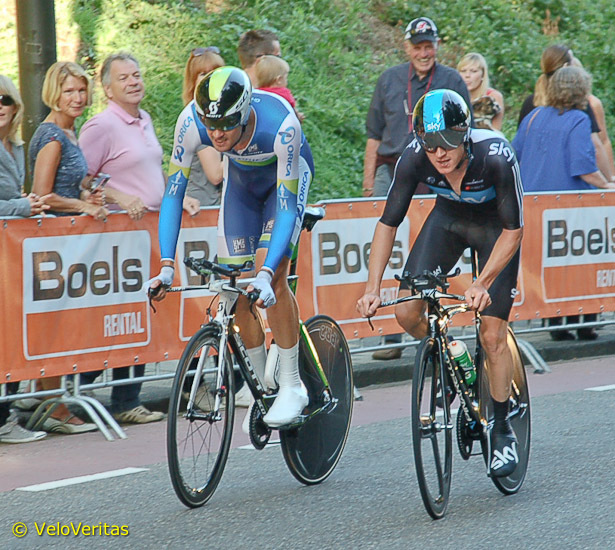 VeloVeritas spoke to Evan shortly after his win, and again today once the race was finished.